Rava Laddu recipe with a little twist in which grated carrot is added to make it tastier and healthier. 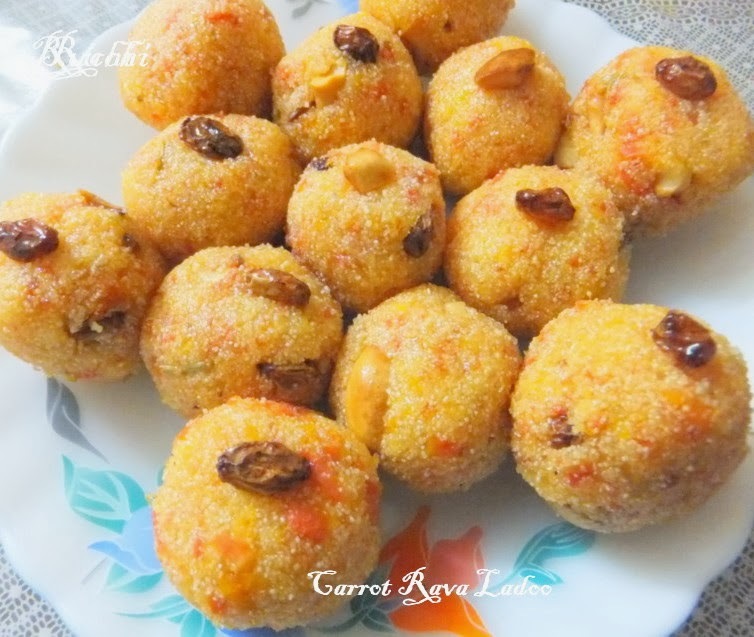 These Carrot Rava ladoos are unique because of the flavor of Carrot in the rava and that extra sweetness of sugar. They were crisp and soft both at the same time This Carrot Rava Laddu recipe is very simple and extremely easy to prepare but tastes fabulous. Welcoming The New year with this delicious dessert! 1. Dry roast the rava in a wide pan till nice aroma arises. Make sure the color of rava doesn’t change. 2. Let it become warm and then grind it to a fine powder in your mixer Make sure there are no granules and sieve it. 3. Mix powdered sugar, rava and cardamom powder. 4. Fry cashew into small pieces and fry cashew & raisins in a tsp of ghee until golden brown. 5. In the same pan fry carrot for 3-4 minutes in high flame and remove. Then add 1 more tsp ghee and roast coconut powder and off flame. 6. In a big bowl mix all roasted rava, carrot, coconut powder, cashews &raisins and cardamom powder sugar one by one and Mix everything well with hands. A wonderful sweet post for a sweet new year. Wish you a very happy new year. Thankyou for sending these ladoos to the event please can you add the event url to your blog post this is mandatory requirement.